The Opera Studio of Webster University's Leigh Gerdine College of Fine Arts presents scenes from five different operas combined in one performance on Friday, Saturday and Sunday, Jan. 20-22, in Nerinx Hall's Heagney Theatre. These fully-staged scenes will include orchestra and guest music and stage directors. 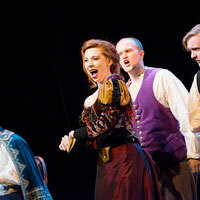 Scenes from Cosi fan tutte, Le nozze di Figaro, The Rake's Progress, Orphee & Eurydice and La Boheme will be performed. General admission is $10, and $5 for seniors. Admission for all students is free with valid student I.D. Friday, Jan. 20, 7 p.m.
Saturday, Jan. 21, 7 p.m.
Sunday, Jan. 22, 2 p.m.